You can book this adventure via the booking hotline +43 660 35 93 672 or by e-mail. At the agreed meeting point: At the meeting point we will check your clothes and make changes if necessary. Please make sure that you are on time at the meeting point, as we are dependent on the departure times of the lifts. Joint ascent: If the meeting point is in the valley, we will approach the launching site together by using the lift and maybe hiking a little. At the same time we will explain to you the further proceedings and fill in the nesessary forms. Please note that the direct approach of the launching site is not included in the flight price. Route to the launching site: Depending on the location of the launching site, a walk of up to 15 minutes is possible. In winter we usually approach the launching site by ski. Most of the launching sites are also accessible to pedestrians in winter. 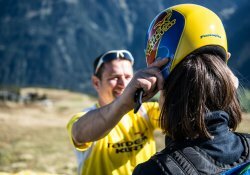 Instructions and preparation: After a detailed instruction of the launching procedure, we will adjust the equipment -harness and helmet- to your personal specs. The launch: The pilot will then prepare the paraglider for departure. After the final check you will get your command and the journey begins. After a short run or ski run we will take off into the "world of birds". The flight: After the launch you will pick up a comfortable sitting position, enjoying the view and feeling enthusiastic. During the flight, your pilot will explain to you the technique of the paraglider and the breathtaking scenery, take pictures and make a flight video of both of you. This is a free service. How to fly a glider? -How to control it? -What happens if the glider collapses? Can you also fly if it is cloudy? Flying in the clouds is prohibited by air traffic law - we need ground visibility. But as the video shows, a few clouds do not present a problem, in fact it is an awesome feeling and a thrilling flight. Well landed: After a nice flight and hopefully very gentle landing we will send to you a download-link for the pictures and videos we made in the air. We hope you had an unforgettable experience and enjoyed a good time in the "world of birds". On this picture you can see "our" 84 year old Rosi after her 4th (!) tandem flight. Thermal flights and superlatives: We also offer very special flights, like these. E.g. 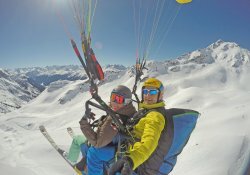 A PANORAMA-SPECIAL tandem flight over 3000m a.s.l. 3-MOUNTAIN FLIGHTS: 3 tandem flights in one day! We will launch from three different mountains. We recommend this flight option to people who want to experience a day full of flying. 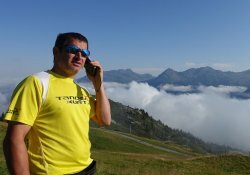 The detailed explanation of the technology, the different launching sites and the extended airtime, is particularly suitable for passengers who want to start with paragliding as a hobby. Here we can also take care of the individual questions and needs of the passenger. 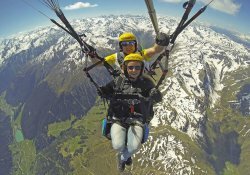 The special feature of this version of paragliding is surely the unforgettable experience of launching from different mountains and enjoying the fantastic, always changing, panorama. The day starts with a morning flight at 8:30 am. The two other flights are then completed depending on the weather situation during the day. 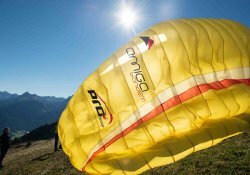 SUNSET Paragliding tandem flight: Enjoy the last sunrays with us on the mountain and experience the magical moment when the day is coming to an end. Start with us before the "Sunset" and sail towards the valley with the paraglider. The cool air, the view and the sunset during the flight will enchant you. These flights are also suitable for couples. Nothing else gives you more satisfaction and a nicer thrill than that. WINTER SPECIAL: SUNRISE Paragliding Tandem: WEDNESDAY | FRIDAY SATURDAY be the first one on the mountain - an experience of a special kind! Early in the morning, at 7:20am before the official ski-slopes open, your adventure starts. Exclusively for early risers, we enjoy the dawn on the mountain and then, together with the pilot, approach the wonderful and empty slopes of the Silvretta Montafon. Finally we will get to the actual showdown - the tandem flight down into the valley. The sun has just risen and the Montafon wakes up for your perfect start into a new day... PS: A great experience for couples - also bookable for 2 persons. Whether it's a marriage proposal, a family trip or a group event. We plan your flight adventure and also organize supplement details including accommodation, transport and side events.